Gazing down from up high on the deck of the airship Kellen, first mate Yohlo Mesh witnesses two former childhood friends, the lonely King Jeremy Fenridge and the skeletal Sir Edmund Monroe, clash. As their feud reaches its bitter climax, a herd of docile Willo beasts grazing in the distance are shocked into movement by the conflict. Welcome to the world of Dor. Relocating to New York City after attending a California State University, a loose collection of stories began congealing in Kyle Kirwan‘s mind, forming a sprawling epic set in his fictional world of Dor, one that he titled The Mudcat Chronicles. “From there”, Kirwan states, “I created a series of over 100 paintings that I showcased in Bushwick, Brooklyn in 2011”. But Kirwan became “burnt out in the fine art realm in NYC”, the artist recounting how it “was around this time that I stumbled onto designer toys” at the Kidrobot store in Lower Manhattan’s SoHo district. Admitting that he that he “always enjoyed world-building and storytelling but never felt comfortable calling it art until I found designer toys”, Kirwan immediately realized that he’d “found a way to bring together a bunch of things I loved”. After spending time refining his sculptural skills to properly pursue this route, “by the time I felt I was ready to make my own pieces”, the artist recalls, “The Mudcat Chronicles was the obvious choice to draw content from”. And while there is “a monumental, eon-spanning history of Dor”, Kirwan boils his premise down to being “an epic adventure at the end of the world”. Beginning at the end of 2012, Kirwan has steadily issued handmade designer toy editions, trying to “incorporate all of my pieces into the canon narrative of The Mudcat Chronicles“, including his arguably most popular creature creations, the ball-like Blooms on their slender legs and the curly fur covered Willos with their antlered heads. “The Willo is based on a painting I made in 2010″, Kirwan said, specifying that this “represented an evil genetically manipulated version of Willo”, “a henchman for the evil forces in the world of Dor”, one which he issued sculpturally as the smaller scale Fallen Willo. But the “regular, standard Willo”, as Kirwan refers to it, is what he would elect to focus on for his more recent, larger scale pieces, financing the initial Willo sculpture’s casting costs through a Kickstarter campaign in 2014. And since then, these large roaming beasts from Dor, as well as the Blooms they are frequently found with, have been reinterpreted by Kirwan through various cast editions and uniquely hand-painted renditions, as well as the focal form for the Children of the Halfcast group exhibition at 2015’s DesignerCon. But it was at DesignerCon in 2017 that Kirwan publicly displayed his next evolution of the Willo, its normally conical tufts of fur replaced with a skull pattern, tendril-like ropes of ooze forming its upper appendages, and a gargantuan face overtaking the beast’s belly. “Unlike the other Willos, which are not representative of individuals”, Kirwan says of this beast, “The Final Willo is a unique character”. Noting that this creature “appears at a time of great upheaval and change in the main story”, the artist describes it as “a God inhabiting a dead Willo”. 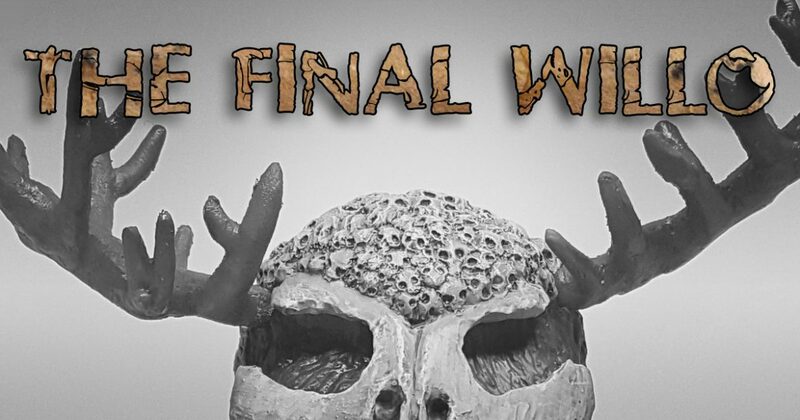 And regarding the ominous title of this work, Kirwan confirms that “this will be the official final release of the Willo” sculpturally, noting that “three limited edition releases are the plan at the moment”. Featuring a purple-hued body with crisp blood red accents fading into pinkish ends, this “standard” depiction of The Final Willo is available to reserve directly from the artist now, with this debut edition limited to a maximum of 10 pieces. And, depending “on how the piece is received”, admits Kirwan, there’s a planned ivory rendition and possible gold & black variation to eventually follow. But this finale for the Willo sculpture doesn’t mark the end of Dor. In fact, “I’m just getting started”, Kirwan eagerly says. “Next up is a series of Baby Blooms“, which will be followed by “some sculpts of the main characters from The Mudcat Chronicles“. And, moving forward, Kirwan is “aiming to have accompanying illustrated stories, be it as a webcomic or printed edition”, the artist inviting collectors deeper into his visual narrative by offering “some backstory with each new piece”.